I finally got my hands on the new Adobe Creative Studio 3 and spent a couple evenings with the Studio's green screen product, which for some reason is called Ultra CS3. (Isn't that a detergent?) After producing a number of green screen clips I can confirm that even though Ultra CS3 delivers a crisp, attractive composite you'll find your sound element mangled so badly that you'll think the Siegfried & Roy tigers got to it. The highlight of this package is the gorgeous interface that Ultra provides. The keyer controls (shown above) are quite impressive. There are sliders that control the alpha curve and sensitivity of your matte, so you can easily wrangle your matte into shape. 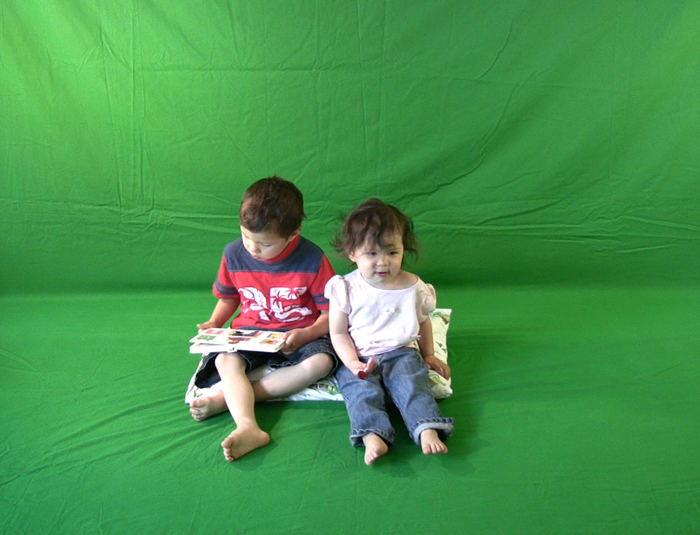 There are highlight and shadow sliders that allow you to control whether or not the shadows falling on the green screen will appear in the final composite. 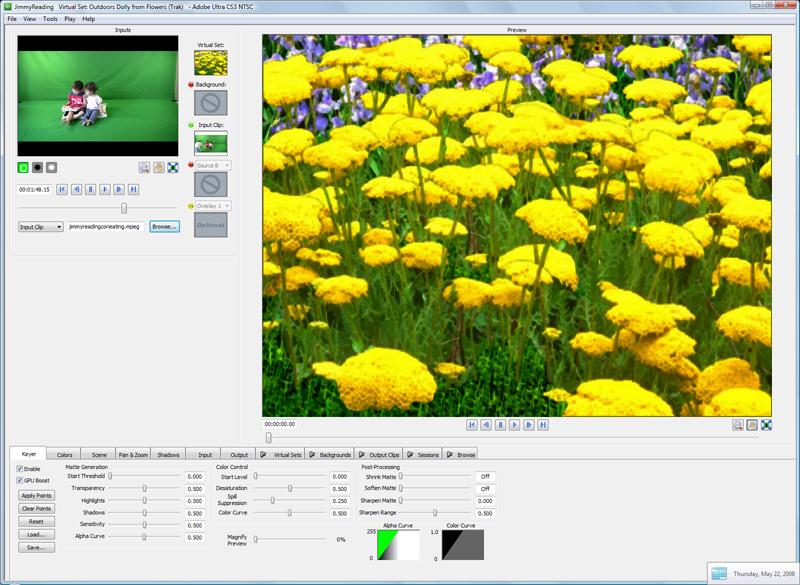 All told there are 14 controls that allow you to tweak the way your content blends in with the background. Which makes it really simple to produce great looking composites that (for some reason) end up being totally out of sync with the audio track. It appears that Adobe has made a green screen product for people that can read lips. It's really inexcusable and makes the end product very hard to work with (you'll need to re-sync your audio outside of Ultra). I should also note that there appears to be some degree of shrinkage in your top layer element after the composite, but Adobe allows you to compensate for this with a scale control (so you can blow that layer back up, but you end up with a pixelated top layer as a result). The end result is a loss of fidelity in both the audio and the visual elements of the original source. The audio issue is repairable, but the image size problem is a one way trip. Trying to fix this with the scale control will result in a clearly degraded source. There is one advanced feature that involves tracking shots. In Ultra CS3 tracking shots are possible with static video elements. Ultra can manipulate your top layer element (i.e. the subject) so that it properly travels with your background. Here's an example of this feature (called the Trak feature) with a Virtual Set that ships with the Ultra product. This is also a great example of the sync problem, as you'll hear the soundtrack fall further and further behind. By the end of the 26 second clip the audio is already about a second late. It's easy to fall in love with this product while going through the compositing process and then fall completely out of love when you see the results (Adobe, I want my CDs back). If Adobe ever resolves the audio sync issues Ultra could mature into a great product, but for now I think the relationship is over. Audio not synched with video upon export? (1) If you are working with an extremely short clip, you may be able to export only the video track in Premiere to Ultra, and then bring back this 'video after ultra' into premiere, and use this version of the video with the original audio track. With this method you have to simply eyeball the placement of the clip, and live with a little bit of drift. Import the 'after ultra' avi (that includes both video and audio) into Premiere. This should produce a Video track 2 and an Audio track 2. Stretch or shrink the 'after ultra' video clip to match the length of the original audio track. To do this first watch the segment of the clip you are attempting to sync with only Audio track 1 enabled. Then watch the same segment with only Audio track 2 enabled. This should help you determine if the picture is early or late (e.g. do you need to stretch or shrink). Yes, that is a great solution to the synchronization problem. You can simply drop the audio track you get from Ultra, which is what I've had to do with my projects. This creates extra work when you try to re-sync in Premiere, however. From a relatively expensive suite of software I expect more. Adobe, you broke my heart. And you still haven't given back my Bananarama CD.